It couldn’t be easier to make sure you get the exact flowers you want this Valentine’s Day. We've taken three of your favorite designs and turned them into beautiful floral palettes that we’ll be arranging in our always interesting vase collection. This helps make things easier on your sweetheart, too! Just save and send the image of the flowers you love the most to your special someone and we will take care of all the rest. We know that both you and your special someone are more creative, more interesting and more special than a dozen roses with baby's breath. That's why we DON'T offer that design. When you call Sullivan Owen for your Valentine's Day flowers, you want something that stands out from the line up of basic and boring. 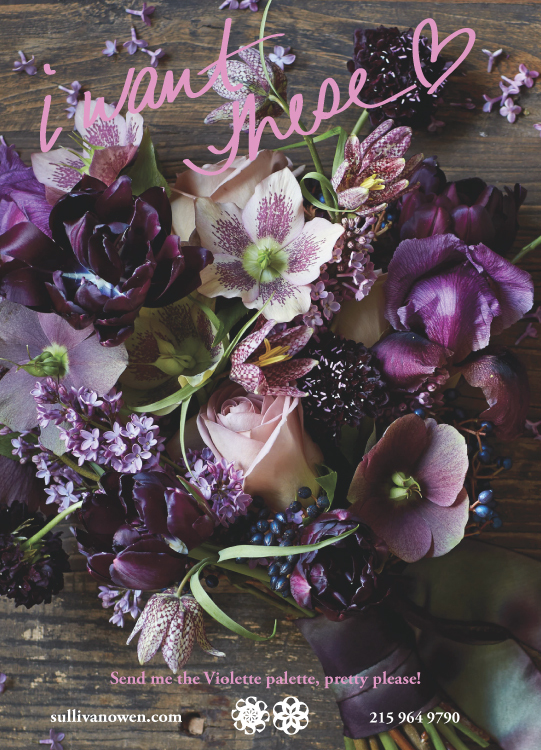 So while we can still send red roses for you, we prefer them to be dark, moody and paired with purple and plum tones. Not a wisp of baby's breath in sight! If your special someone is into another color all together, we've got that covered as well in both sophisticated shades of cream, peach and blush or bold and bright pink. 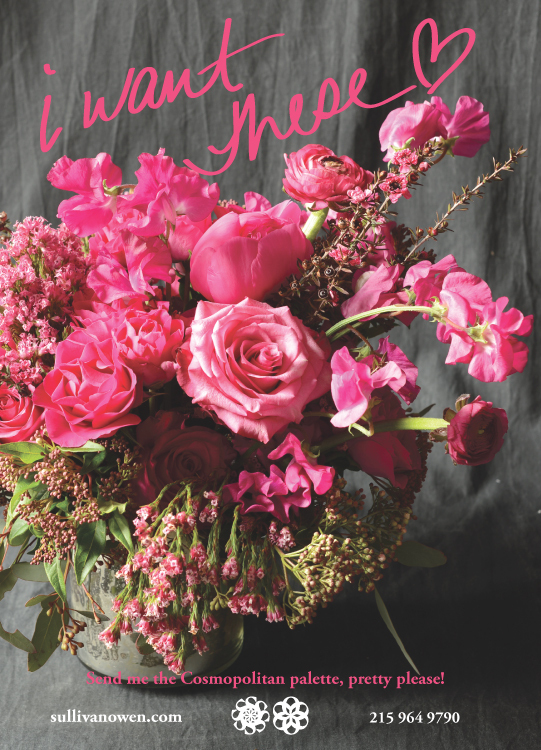 Call us at 215-964-9790 to get your order placed today as we expect to sell out of flowers this year! What?? You still haven't placed your order for Valentine's Day?? Fear not! Though we aren't available to take phone orders over the weekend you can send your order via email to hello (at) sullivanowen.com and we'll call you Monday morning to complete the order! Please include the best number to reach you at on Monday and do not send credit card information. We'll get that over the phone! Well, we’re wrapping up our first Valentine’s Day and I have to say it was an amazing success. I truly loved all the designs we sent out today and I hope the lucky recipients did as well. We had requests for all kinds of color palettes from V-Day red to bright yellow so the studio was literally bursting with gorgeous blooms and the scent was pretty amazing according to the guys that opted to come in and pick up their orders. The stars of the show today were definitely the Japanese sweet pea which smells so good, you want to eat it. There’s some in the arrangement below in an electric pinky-red. With fresh water and our elixir they should last 2 weeks or more. We send out every order with our Cut Flower Elixir and care instructions on the bottle to help you keep the flowers looking good for as long as possible. Here’s one of the highlights of today, a stunning explosion of pinks with dark accents. I LOVED making this arrangement and I know the lucky lady who got it loves it too.